Ducati’s Marco Melandri completed a double this weekend at Phillip Island by taking another win earlier today. Melandri beat defending champ Jonathan Rea (Kawasaki) at the line in a photo finish after a race-long battle with several riders. Xavi Fores (Ducati) finished third. Race 2 earlier today was a “flag-to-flag” requiring a mid-race tire change. Despite this, the same lead group of riders seemed to emerge following the tire change, and included protagonists from several teams, including Kawasaki, Ducati, Yamaha and Honda. Chaz Davies (Ducati) led for a while after the tire change, but then crashed (unhurt). Melandri, of course, has the points lead after the first round of the series. You will find full results to Race 2 here. For additional details and points, visit the official WSB site. I remember watching the Monza round a few years back and listening to Randy Mamola go and on about the four cylinder power of the bikes competing against the Ducatis. If you’re going to compete, don’t bring in a v-twin to compete against inline fours, then complain about being uncompetitive and then lobby to have the rules changed. And they did it to very good effect. Alot of wins and championships over the years. I don’t like parity or rules being slanted for or against a certain group. Doc, how many times do we have to go over this? Anyone running a twin (or triple) against fours must have some rules break to be competitive, whether that is extra displacement, less weight or something else. Why? HP = RPM x Torque/5252. So HP is directly proportional to RPMs and twins/triples have longer strokes for a given displacement than fours. Maximum engine RPMs are limited by piston speeds and engines with longer strokes cannot rev as high as those with shorter strokes. If you want true rules parity, then all the race bikes will be fours, which is what has happened. So much for powertrain diversity. Apparently you didn’t get the gist of the post. And I don’t need a power lesson from you. The marketing aspect (whatever the podium guys hold in the hands) is old, phony, and tiresome. The vendor badges filling every inch of their leathers and helmets isn’t enough? Glad to see Rea not win. I have nothing against him personally, but it seems better for the sport unless you’re a big fan of Rea and Kawasaki. I admit that I owned many Suzuki motorcycles, and few Kawasaki, and never moaned when Mladin owned the field for several years. So yeah, I get those who are unhappy with the rules putting Kawi at a disadvantage. Thanks to all the riders for risking your lives and thanks to all the sponsors and organizers for putting up a fantastic show .. I really appreciate everything you have to offer .. There will always be an over analysis of all the rules / changes and what if’s and what not’s but as a racing fan, Thanks again to all the riders ..
Not trying to start an argument which would be easy to do with a topic like this, but wanted to give my perspective. You don’t have to be very old to remember back to a time in Superbike racing when the twins had the same engine size as the fours. Quite often Ducati ruled the tracks and took many championships. This was of course before the revolution in electronics and the twins enjoyed that torque which gave them good drive mid corner and were arguably easier to ride and control that the peaky 4 cylinders. Electronics allowed the 4’s to close the gap. I also recall not too many years ago Ducati being allowed a bump in engine displacement because in order for them to match horsepower with the 4 cylinders of equal displacement the twins were getting unreliable. There are other factors making twins less competitive in this level of racing but I think in my humble opinion it has been proven time and again that the competitive days of the twin are over. I find it a shame, I love the sound of that big twin. Once the twins were allowed 1200cc displacement (and actually a little bit before that), the twins were again competitive with the fours. It is impossible to build twins at the same displacement level as fours with equal power, as they would be at their reliability limit based on piston speeds. OBTW, this isn’t a “twins” thing – at a given size eights will rev safely higher than sixes, sixes higher than fives, fives higher than fours, etc. Any powertrain engineer knows that maximum HP is directly related to maximum RPMs, which is why twins need the displacement advantage to compete. Watching the Kawasaki/Ducati battles of the last few years, I’d say the Ducati Panigale chassis was more of a handicap than the V-twin engine, as exemplified by Melandri wobbling down the PI straights and the number of times Chaz Davies has “hit the dirt” while leading races. Ducati addressed that design aspect on the new V4 (rearward rotated engine, longer frame spars attached to both cylinder heads), but could have done so on the Superquadro V-twin as well. I think you may be recalling the period when they first bumped 4-cylinders up from 750 to 1,000cc. If I remember correctly, at that time, the I-4’s ran restrictor plates on their intakes, ala’ NASCAR to handicap their peak HP. You mean intake restrictors like Ducati has had to run the last few years? I was not aware that Ducati was made to run restrictor. I don’t know the exact nature of the restrictor used on the I4’s, I just recall reading that they were limited on the intake tract and the word restrictor was used to describe it. The restrictors were actually first introduced to help the rest of the field catch up to Ducati. If you look at the 2018 WSBK technical regulations you’ll see intake restrictors listed for twins but lined out for 2018 – Ducati had to run them the last few years and, to my knowledge, none of the fours did. The production 1199 R had larger intakes than the race bikes. Initial impression is the new rules favoured the Ducati team again. Anyway, based on the new rules, Ducati should have its max rpm lowered from 12400, while Kawasaki will have its max revs raised, in the next race. Or Ducati did a better job than the rest working with the new rules package. Dorna won’t be changing the rev limits so quickly; I think it states three race weekends before they could. Ducati’s performance at PI sure makes it look like the new V4 wasn’t needed, except for the chassis changes (that wobble looks dangerous to me). I don’t like at all this artificial competitiveness. Rea defends himself like a lion in the twisties, and then was overtaken on the line by a much faster Ducati that wobbles like a snake, and evidently has less engine limitations than the Kawasaki. Not true (about less engine limitations). Ducati’s max RPMs were limited for 2018 as well. The Ducati has the same rules restrictions as the Kawasaki by virtue of a fairly high average finish last year. The Ducati riders feel it’s unfair because the Kawasaki has been dominant, and Ducati only recently matching them. Generally, the Ducati is down on peak power and top speed. Sounds like they just nailed the setup this weekend. 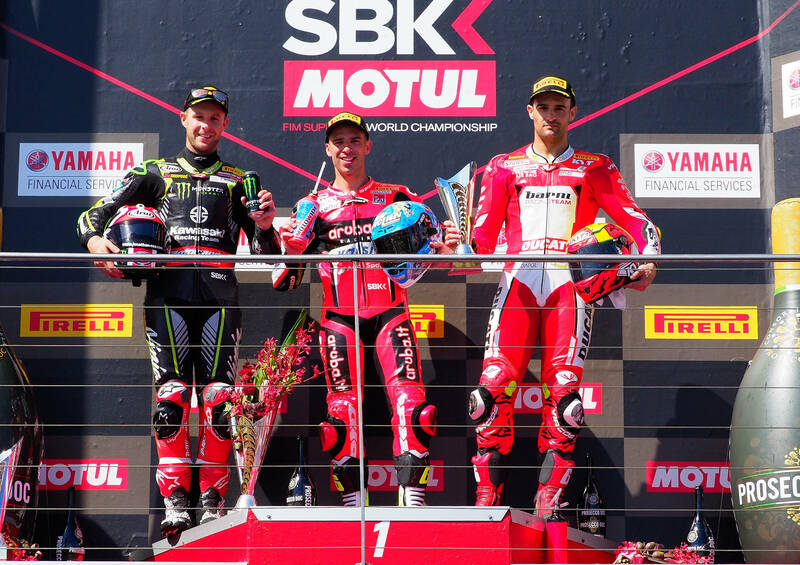 I’ll repeat what I said earlier – Ducati’s twins are fully competitive with the fours in WSBK given the current rules package (and were last year as well). There was no compelling reason for Ducati to abandon the twin cylinder format other than to leverage their investment in motoGP. What Ducati should have done is the same as with the new V4- rotate the Superquadro engine rearwards and create a front frame that connects both cylinders to the steering head – maybe that would help eliminate the “wobble” I saw Melandri’s bike exhibit on track. Getting trounced for the past few years in WSBK would be plenty of reason, but the more likely reason is that across the spectrum of retail products that Ducati competes in, they likely found that their engine configuration was no longer a reason that their customers chose (or didn’t) Ducati. The MotoGP angle is marketing only. Street bikes could never afford MotoGP level parts, any more than MotoGP could be run successfully on street appropriate parts. C’mon Dave, Ducati didn’t get “trounced” these past three seasons – they were the only real competition to the Kawasakis. And Johnny Rea did a fantastic job riding the bikes. The Panigales ran well, but too often the riders found themselves on the ground during the races, let down by a suspect chassis design, not the engines. Now how would you know whether potential buyers chose Ducati (or didn’t) based on the engine configuration? Without market research data, you don’t. What is for sure is that with the elimination of Ducati twin superbikes consumers now have only 4-cylinder bikes to choose from – pretty boring. Kawasakis won 18 races last year, Ducati won 8. Aside from the two factory Ducatis, there were only two others in the whole field, one of which didn’t manage to score a single point. Being Kawasaki’s “only real competition” supports my point. Ducati has been making V-twin super-bikes for decades. When they stopped doing SS swingarms, sales tanked so they’ve learned their lesson about walking away from their signature features. They would never take the risk of giving up the twin if they didn’t know the customer was ready for something new. And boring? Have you ever ridden or heard a V4? Sales tanked when Ducati released the 999 superbike, which didn’t have the “look” people expected, including the SSSA feature. Ducati just walked away from their primary signature feature – V-twins, by making their showcase machine a 4-cylinder. I think it was a marketing call based on their motoGP investment, but I wasn’t in the boardroom when that was discussed. Please don’t make this personal. I’ve been riding bikes for a long time (plus 3 yrs road racing) and have either ridden or owned singles, parallel twins, V-twins, an inline triple and various flavors of 4-cylinders, including V4s. Nothing against V-4s (except maintenance cost), but I regret that Ducati dropped their pinnacle V-twin entry. Variety is good for the consumer. All true, and the 999 was a demonstrably better bike than it’s predecessor. I don’t think they’ve gone away from the V-twin carelessly, and I’d be surprised it it goes away from their sportbikes all together, if only because of the cost of producing V-4’s. It is still the platofrm used in all of their other, much higher volume bikes. I’m sorry if I came across as getting personal, that was not my intention at all. However, I haven’t heard too many journalists refer to the new V4 Duc as boring. Have you heard that thing? Boring in that there is less consumer choice in superbikes. The market already had plenty of 4-cylinder bikes, including V4s. Going forward it will have no V-twin entries. Yes, I’ve heard it run; it sounds quite a bit like their V-twins and nothing like the RSV4.